The idea of being real, taking care of myself, being my best friend is so enticing. It’s the complete opposite of how I have treated my self over the last 44 years. Naturally I was attracted to this program, but actually doing it released a flood of fear. Thoughts such as ‘who will I become’ or ‘why bother, you are who you are’ kept me at a distance. When I finally watched, read and listened I was still full of doubt. It wasn’t until Session 4 that I took a conscious pause, let myself go (even if it was a few moments) and allowed it to get into me – to consider myself a friend, to acknowledge being good to me without fear or guilt. I love listening to Heather and Jo, they make me feel supported. I continue to listen, re-watch and re-read the session materials, skipping to and from bits of the program I love or need right now. I guess this is what taking care of myself is, stepping through layers of fear to getting to know and enjoy being me. This program is powerful. Really powerful. Whilst I have been on an ‘inner journey’ of self awareness and self discovery for over 20yrs, I found Authentic Woman profoundly inspirational and transformative. The fact that it’s underpinned by neuroscience and proven research really helped me to feel ‘justified and motivated’ in putting my time into what was suggested. Each session had such gold in it for me, so I enjoyed taking my time and integrating each session. It has been a deeply nurturing and nourishing experience – beyond the type of ‘self love’ I’ve tried before. I’m the kind of person after an amazing life, not externally (although I won’t turn it back!) but rich in terms of my relationships and connections. To me relationships are the most important element of my life, and whilst I can often show up as a great friend, I fall far short of this when it comes to how I treat myself. This program has allowed me some of the time, permission and guidance that I’ve needed to enhance, deepen and soften this relationship, which of course is allowing so many other areas of my life to flourish. Authentic Woman has been just that for me, a way of being that’s allowing me to be my more authentic self, day by day, imperfectly. No big grand promises, no brand new life, no quick fix by self help gurus – but a gentle framework for showing up and leading the kind of life I truly desire. Thank you Heather and Jo. I recently completed the Authentic Woman course online. I do love a good online course and have done a few over the years. But Authentic Woman is in a class of it’s own. It is comprehensively developed and beautifully presented, it was an absolute pleasure to log on ever week. I felt like Jo and Heather were my own personal coaches supporting and encouraging me every step of the way. The supporting material like the eBooks and the homework are thoughtfully combined with the online learning materials. It was beyond my expectations in every way. This course delivers a deeply transformative experience that helps you create a more meaningful life if you truly commit to the process. Thank you Jo and Heather. The Authentic Woman program is WOW! A blessing and a gift – one that I believe is essential for growth and truly becoming Me! I feel proud to give this gift to myself and share it with all those that I love and care about. 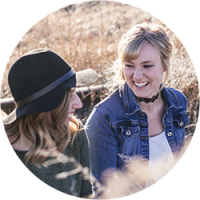 The combination of the facilitator’s content, knowledge, teachings, and most importantly the expertise Heather and Jo have shared to create this program is unlike anything else available that I’ve experienced. The program has taught me to actually embody self-compassion. I’m less judgemental and more accepting of myself – truly! I am using many of the learnings in my daily life, and though the benefits are too many to list, the biggest benefit of all is that I’m spending more time thriving and in gratitude, than self-criticising – and this is liberating! Pause and Breathe everyone.